Practice with a wood or stone ball was traditionally part of the curriculum when studying many Chinese martial art styles, until about a hundred years ago. Because of repeated cultural upheaval, some of the deeper aspects of tai chi (known formally as taijiquan, "grand ultimate fist") were lost over time. But now, the taiji qiu or tai chi ball is making a comeback. Practice with a wood or stone ball was traditionally part of the curriculum when studying many Chinese martial art styles, until about a hundred years ago. Because of repeated cultural upheaval, some of the deeper aspects of tai chi (known formally as taijiquan, "grand ultimate fist") were lost over time. But now, the taiji qiu or tai chi ball is making a comeback. People are finding that it is a perfect whole-body exercise that trains the physical body while also developing your internal energy (qi). The peaceful circular movements of ball practice helps you to quickly get into the relaxed state of moving meditation and stay there for longer, which maximizes the health aspects of your tai chi. A natural material like wood or stone will "harmonize" with your body's energy. Other materials, like rubber or plastic, act as insulators, blocking your energy. As your energy increases, you will become more sensitive to the feeling of your qi circulation. Different types of wood will have a different feeling. These subtle, subjective experiences that we have during tai chi and qigong are sometimes challenging to describe. Ideally, you want to turn your attention inward, and pay attention to the physical feedback that you feel during practice. The more relaxed your muscles are, the more abundant your qi circulation will be. It is recommended that you start with a ball that is a comfortable weight to train with for fifteen minutes. Usually a beginner can use a four-to eight-pound ball at first. Start with making basic circles, forward and backward, vertically and horizontally. It can be helpful to use a mirror, in order to make your circle to be as round as possible. Over time, you will increase the duration of your practice to one hour (or as long as you have available). When you're ready, you can progress to a bigger ball, which adds weight to your practice, and increases the distance between the palms. With continued practice, your physical body will become stronger and more flexible, which relieves many health issues, especially back pain. In addition, your energetic circulation will improve, giving you more energy. Ultimately, your higher goal is to feel the energy between your palms through the ball. There are not many references about ball training available to the mainstream. Students training kung fu in a traditional lineage may hear stories from their teacher. Master Yang, Jwing-Ming says that when he was a teenager in Taiwan, you could see people often training tai chi ball in the park. Fifty years later, it is unheard of. Chen Qingzhou, a nineteenth-generation Chen master, says: "In the past, the previous generations of masters placed great emphasis on special power training techniques (xing gong), training with a taiji sphere of over fifty pounds, hitting three sandbags (da san dai), and training with a stick [or ruler] (xing gong bang) in order to develop the foundation gongfu of Chen-style taijiquan. From the Qing dynasty, after the introduction of Western rifles and cannons into China, people became indifferent to traditional martial arts training. The more difficult postures were eliminated from the old taijiquan training routine, which then developed into more of a health-oriented practice. A few of the methods that were of benefit to developing 'gongfu' were no longer practiced and basically should have ceased to be transmitted." Tai chi ball practice will rebuild your health, your strength, and your flexibility, but the ultimate goal is to develop your qi. Like all qigong training, it aims to increase the quantity of your energy, and improve the quality of your circulation. Master Chen says: "When I was learning the taiji sphere, there wasn't any taiji sphere to practice with. It was only by explaining a few movements by describing the movements with empty hands and performing as if holding a taiji sphere that I was able to learn...I happily purchased one as if it were a precious object and have practiced with it up until the present day, the surface of the sphere turning into a shiny black color. "At first, when I trained with it, I felt that it was a little heavy. 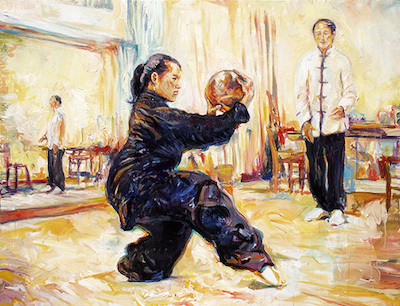 By training in taijiquan according to the 'eighteen methods,' until the internal qi drives the external form, then training in revolving of the taiji sphere, means that the dantian will move the revolving of the taiji sphere. Eventually it seems as if there is an invisible sphere inside the abdomen. When pushing hands with another person, the sensations are transmitted to the sphere inside the abdomen, which can naturally respond in moving the whole body, thereby responding to circumstances and reacting accordingly. [Even] some people who feel that this is something quite strange, after pushing against my abdomen with their hand, say that there is a rotating sphere, yet they cannot find where it rests and their hand will feel painful upon contact with its reactive force. "The years have passed like flowing water, and practice with the taiji sphere has accompanied me these twenty-one years. The taiji sphere draws those who truly love gongfu into practicing with it. In practicing it I have worn out many pieces of clothing and hurt my hands and feet, really sweating and bleeding, yet, throughout the years I persist in practicing it, without letting up. "One time, five years ago, I was lying on the bed and felt my dantian area involuntarily snap upward several times; I thought this was interesting. This made me try an experiment, putting an object on my dantian and finding I could cause it to spring upward. After practicing it many times, now I can send a fifty gram piece up into the air over twenty centimeters."